Well, my adventure wasn’t without it’s disappointments and some frustrations. My laptop died on me not long after I arrived at Damsite. It was crushing, but I dealt with it the best I could. So, the daily blogs turned into daily journal entries instead. I’m not entirely sure how I’m going to proceed with telling my story about New Mexico. For now, I’ll just start with this blog and see where it takes me. Aside from having to purchase and set up a new, refurbished laptop, which by the way, is running beautifully, with lots more speed, I came home to some sad news about a dear friend. It’s been a very difficult last few days. My main concern now, is getting into the studio to start producing work. Because I didn’t get much painting done while at the residency, I’m going to take the 18 or so pieces of pre-cut Mylar and begin small oil studies. I have over 300 photos to work from, which will hopefully jog my memory and take me back to the places I visited. Music will need to be carefully chosen, in order for me to channel my emotions and bring to the surface the ideas I accumulated, over my two-week stay. One thing I know for certain and this came to me at the end of my trip; I want to introduce various physical elements into the landscapes, by that I mean natural and man made things. These will possibly include: windmills, cisterns, trees, RV’s & Airstreams, hollowed drift wood, tumbleweeds, rocks, etc. Basically the plan is to work the foreground, which I have not done in my work, in many years, so the challenge is on! I arrived in Albuquerque Tuesday night, after nine hours of tiresome connecting flights, then the next day I made my way to the Historic Damsite District, once a national park, now a vacation spot for campers, RV enthusiasts, fishermen, and four years ago it also became an artist residency. Just ten minutes outside of Truth or Consequences, the residency offers artists inexpensive lodgings in a beautiful setting. 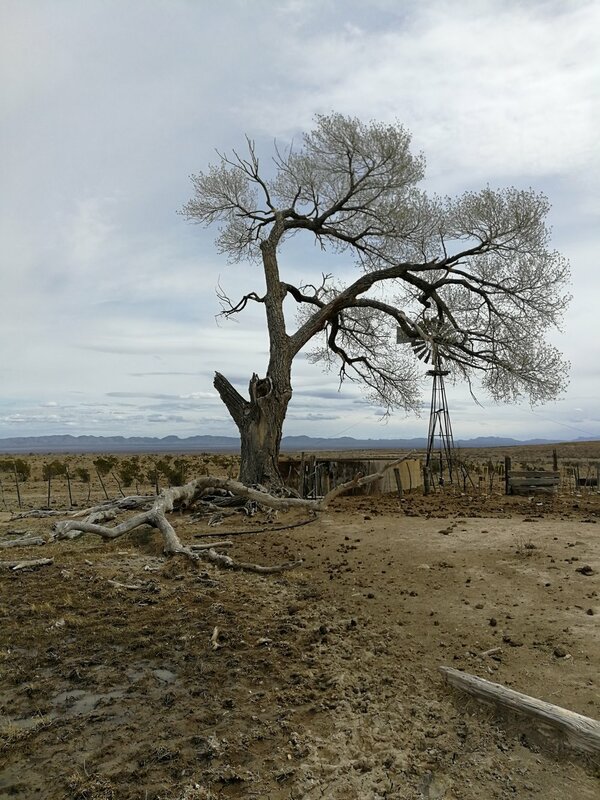 As I was driving from Albuquerque on my way to the residency, I was astounded by the landscape, I’d never seen anything like it, at that point I knew I had made the right decision to come here. The long straight highway, Interstate 25 South is majestic to say the least, and this is only the beginning of my trip. There is so much to see here, I feel a bit overwhelmed, I plan to take full advantage of this once in a lifetime opportunity. Folks here are super friendly, as I had expected. My lodging is one of several casitas which are humble but very cozy little adobes. The sun is shinning today, it’s 16 degrees, just the perfect temperature, I was told I brought the good weather with me The landscape around me is arid, rocky and sun bleached but last night at dusk, I saw what I had only imagined, a golden hue swept over the hills, I was stunned. The light really is spectacular here especially at dusk, it started to get quite cool and then became very dark and I could see stars, infinite stars. I’ve met most of the staff and one neighbor. I was also invited to go fishing with Brad, the caretaker, originally from Nebraska, a burly old guy with a long white beard, who lives in his trailer across from my casita. 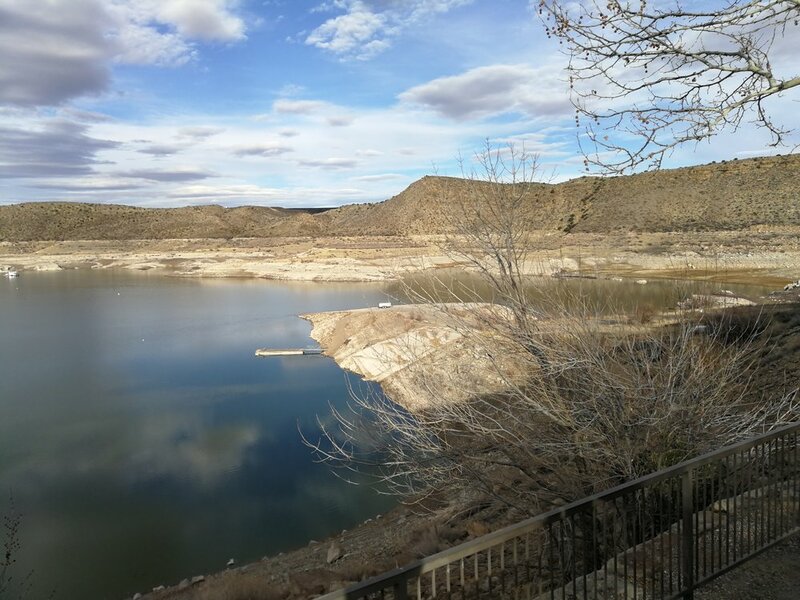 This state is quite poor, there’s not much to do in Truth or Consequences, which has a lot of trailer parks but the hot springs do bring in the tourists and folks from all over NM and elsewhere, so that’s what’s driving the local economy, plus the marina, a popular vacation destination. Fun fact, T & C was once named Hot Springs. I think that’s enough for today, I need to make these blogs a bit shorter. I’m off now to make art! When I knew for certain that I was going to be able to afford to go to New Mexico for this residency, thanks mostly to a certain Mr. Miller who bought one of my larger works and of course to my loving husband for supporting me, I thought to myself, I’ll need a hat while I’m there, among other things. 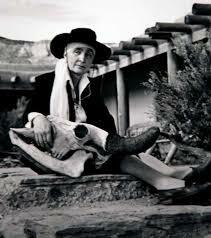 At first, I thought about getting a cowboy hat, but then I thought, better yet, I’ll get myself a hat just like the one Georgia O’Keeffe wore. So, I started my research, I scoured the internet for places that might sell said hat. I wasn’t quite sure what the name of the hat was, I found various descriptions and names like; Parsons Hat, Bolero Hat, Spanish, Mexican, Zoro hat, etc. Finally I stumbled upon The Old Town Hat Shop and voila! I had found my beautiful Georgia O’Keeffe hat, resplendent with silver conchos and a chin strap. I ordered my Ole Spanish Bolero immediately and thought about how much I was going to enjoy wearing it and channeling my inner Georgia O’Keeffe. The only thing I was worried about, was maybe looking a bit pretentious, screw it I said, I’ll be fine. I also realized, after the fact, that the hat shop was actually in Albuquerque, what? That’s crazy but so fitting. The next day, the hat shop called me saying that there would be additional costs for shipping to Canada, I was so excited to see the area code come up on my phone. We decided that it would be less expensive if I picked it up in Albuquerque, so that’s what I’m doing. I fly into Albuquerque arriving at 6:15 pm on the 26th, I’ll be staying at the gorgeous Ramada Inn at the airport, the cheapest and most decent hotel according to Will. I found an Irish pub in town where I plan to have dinner, I’ll ask my Uber driver to find me a liquor store so that I can have a bottle of wine for the night. Then Wednesday morning, I’ll get up, get myself to the Old Town Hat Shop, pick up my precious hat and high tail it via Uber to Los Lunas to pick up my rental car, a tiny Mitsubishi Mirage, that I’m praying will get me around sans problemo! Various other assundry items purchased for this big adventure include portable art supplies, consisting of water colours, sketching supplies, and a small oil painting kit. I plan to stop and sketch as much as I have time for, I have also borrowed a good digital camera from a generous friend. Journal entries, videos as well as the expected selfies will be plentiful. I’m hoping that I can create a following, engage people interested in my work and processes and tell really good stories. The only major concern I have at this point, is whether the American government will shut down again. If that happens, I will not be able to get into many of the national parks and monuments that are on my hit list. I will be absolutely devastated if that happens. The entire focus of this trip is about seeing these incredible landmarks, places like White Sands National Monument, the Bisti Badlands, the Carlsbad Caverns, Shiprock, Chaco National Historic Park, the Taos Pueblos, the Gila Cliff Dwellings, the Kasha-Katuwe Tent Rocks National Monument, and the Bandelier National Monument, just to name a few. I don’t exactly see myself jumping fences to get into these magnificent places. I’m also hoping to tour some ranches and farms with my friend Mr. Will Dooley and it would be so awesome to meet some local families, and be invited to a home cooked meal. I’m not Anthony Bourdain, but I certainly admired him and have loved watching his shows, especially watching his interactions with locals as he travels around. There was a great episode on New Mexico, I took notes obviously. I think that’s it for today, stay tuned for more entries coming this week. Adiós por ahora amigos! I have eighteen days to go before I hit the road and travel to the Land of Enchantment. I’m so excited and a bit nervous because this is the second biggest trip I’ve ever done on my own. The first big residency was to Pouch Cove Newfoundland back in 2000 for what turned out to be a six week long stint, originally scheduled for four with an unforeseen exhibition happening the last week of my stay. It was an incredible adventure, one that I will never forget and it generated a ton of work. I ended up painting Newfoundland for many years after that initial experience. As for New Mexico, my ticket is bought, my car is reserved, my B&B and Inns are booked. All in all I calculated that I will attempt to visit eighteen different sites, and travel over 3000 kilometers, if I can manage that, the numbers seem be very daunting at this point. I’m doing as much advanced research as I can. As I prepare for this adventure, I’m reading up on Kit Carson and Billy the Kid, I’m also reading a book about the West; Blood and Thunder, An Epic of the American West, by Hampton Sides. I want to make sure that I know my history before I get there. It’s funny, how Canadians know so much about the U.S and yet they know so little about us. I’ve charted out my routes as well, I ordered a TripTik through CAA, a very handy little book that will ensure that I don’t get lost or run out of gas while I drive along those long empty highways. Apparently cell reception can get quite spotty in the mountains and canyons. My host, The Damsite Historic District in Elephant Butte (about a nine minute drive from Truth or Consequences) has little casitas that they rent out to artists and the general public, they look quite humble from what I can tell in the pictures, but they are fully equipped little houses that have all the basic necessities. Mr. William Dooley, the staff historian has been so helpful and seems so friendly, as we have corresponded quite a bit over these last few months. 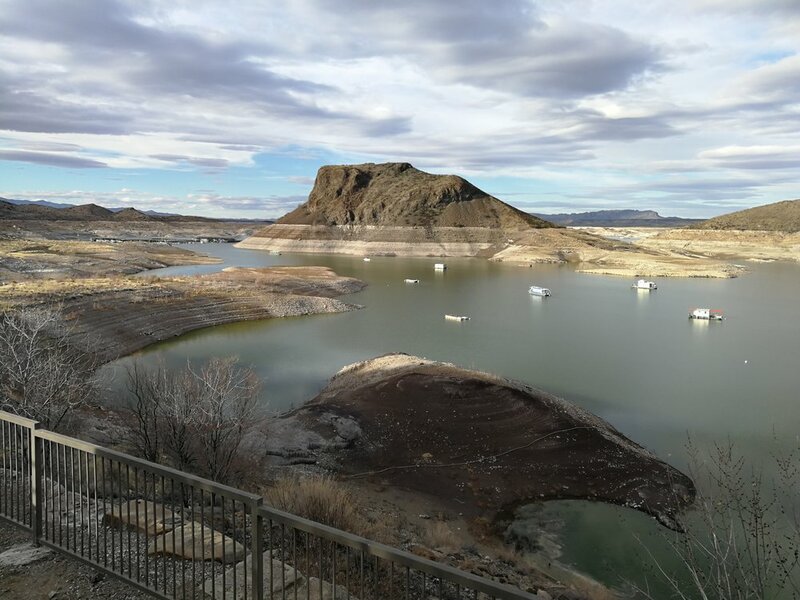 There is a marina on site and it is part of a state park, so the place is probably very lively during the Summer months, as the RV’s come in and campers set-up. The site is on a huge lake with miles of beach, I can hardly wait to see it for myself. I intend to continue this blog series before, during and after my journey, so stay tuned for plenty of pics and lots of blog entries. All content copyright © 2000-2019, Patrice Stanley.